Russell started racing in 1995 in the MGCC BCV8 Championship after spending the whole winter building a Standard class car from a chassis up with Dad Roy. The car being an MGB Roadster 1973, which had the potential to do Brands Indy in a 57-58 seconds. He passed his ARDS with 90% pass rate first time at Brands in the January of 1995 and first race was at Silverstone in the March. 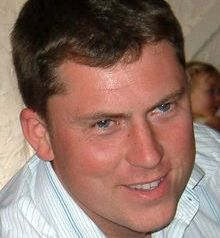 Rusell took the Season to develop racing skills and became a serious contestant in the A class of the championship, i.e. Standard with a few tweeks. His second year 1996 he also raced in the A class with more experience and managed to come 3rd in class and also ended up as the youngest driver in top 10 Overall. Russell's third year 1997 he was determined to do better but by now brother Spencer, 11 months his junior had joined the Championship and the class had got seriously bigger and Russell ended up 4th in class A. Fourth year 1998 and Russell felt it was his year, he tried very hard but a few mechanical problems put him behind Spencer who was now also taking his racing seriously and all Russell could manage to do was chase Spencers’ arse all Season and come in 3rd in class again. During 1999 both Russell and Spencer decided to move up into the B class of the BCV8 Championship and both went out and blew them away. From then on the B Class of BCV8 became alive with Russell and Spencer at the front of the class being joined by newcomer to track racing youngster Rob Huff. Back in 2000 Rob was just part of the trio who were always at the front of the class. By 2006 Rob Huff had moved on, firstly into the Seat Challenge and then into the World Touring Car Series where he is doing very well with Chevrolet and in 2007 Spencer moved into the Ginetta G20 Seniors Championship. 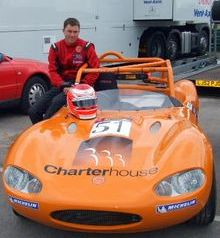 Russell joined Spencer in 2008 purchasing a Ginetta G20 and he competed in the Ginetta Seniors Series for two seasons coming home fifth in both years. 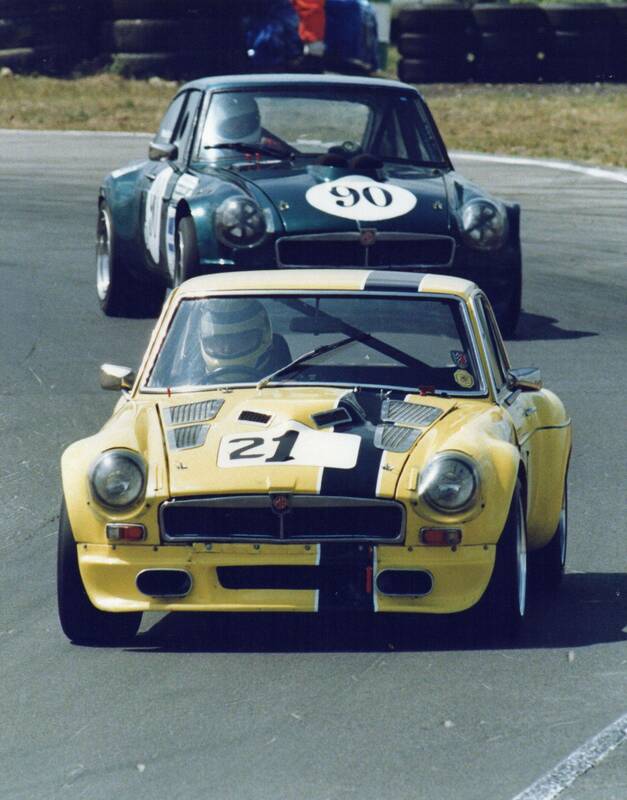 2010 he was back to his MGB racing in the MGCC BCV8 and Thoroughbred Championships. The year ended sadly with the loss of Roy and the whole family have to come to terms with the future without him, their Captain. Russell and Roy were just about to start a business together with a Race Preparation, MOT and General Mechanical Garage. All was in place, some contracts had already been agreed so the venture proceeded but now with Pam and Russell. Over the winter of 2010 and into 2011 Russell worked hard preparing the premises, demolishing the existing contents and by May the equipment had been installed, he had built a new office and by June the garage was opened. No better time to start a new business, deep in the worst recession for 30 years, only one way to go and that was up. The Garage was named Mount Garage a name decided before Roy had passed away, devised from the name of the building Mount Works and the initials M and G. Just a mile from the M25 at Jn 8 in Lower Kingswood on the A 217, a couple of miles from home. Racing started again in April and Russell decided to rebuild the yellow MGA that had been put away back in 2000 and bring it out for the Season in the Thoroughbred Championship. He straightened the chassis, replaced the engine and he now fits snuggly into the car that his Dad started racing in back in the 70's. So far he has been up front and he won outright at Oulton Park in the rain. 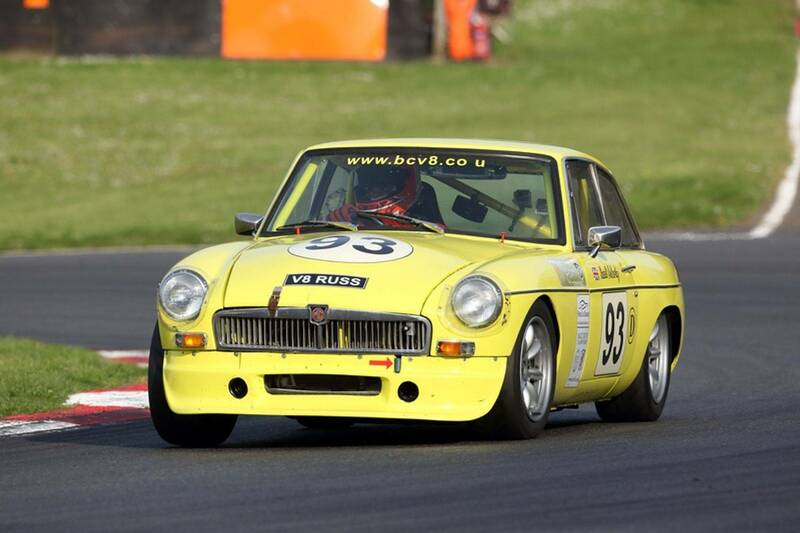 He is racing his MGB Roadster in the BCV8 Championship and currently leading class B. The Season went well and MGCC had a memorial meeting for his Dad at Thruxton in July and Russell put the MGA on Pole Position next to his Brother in his Dads MGBGTV8. The order as they crossed the line together by just .02 of a second. Thats for our Dad they said. 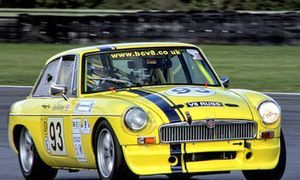 Russell won the B Class of the BCV8 and came home second in class in the Thoroughbred Championship in the MGA. The Garage was going well, building up slowly. The MOT station is bringing in lots of regular work and the Race Preparation side is blossoming. In 2012 the Garage was awarded with the Epsom Guardian Garage of the Year by lots of happy customers who had discovered a good reliable garage in their midst and Russell's talent in sorting out their problems. The 2012 Race Season started in April and Russell was back on track doing what he loved, now building up a reputation for producing fast reliable Class D race engines. 2013 was another good year for Mount Garage again winning the Garage of the Year by the Epsom Guardian and the Race Season again started in April and there were now four cars on the BCV8 grid with big D Class engines built by Russell. A trip to Spa in Belgium in September was a great success for 'Team McCarthy Motorsport' when brother Spencer took the overall win out of 75 drivers in the original V8 of his Dad, Russell not too far behind. 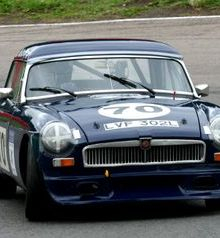 Russell also competed in the 6 Hour Classic FIA race and the Team of Mike Harris, James Wheeler and Russell came home first in class for MGB's. 2014 The general garage was going from strength to strength as was the race preparation side of the business. Russell had been racing for nearly twenty years and although he had won the classes many times he had never quite managed to get a championship. 2014 was however going to be that year and by the end of the Season he had won the BCV8 Class D and had won the overall Thoroughbred Sportscar Championship outright. In July he became a Dad so little Reid Jax came along to the Dinner Dance Presentations in his DJ Babygrow but soon fell asleep.